The National Association of Realtors (NAR) offers grant funding for small, community projects to enhance public spaces called Placemaker Grants. Every community has a variety of public spaces, some of which are noticeable and others which may be hidden. Public places most recognized are parks, streets, boulevards, and plazas. But public spaces are also found in between private spaces such as alleys, neglected courtyards, and stairways. These could be a city’s most underutilized and potentially valuable assets. However, even noticeable public spaces in communities may be unused or underused because of safety concerns or because they have deteriorated — all of which can be improved to increase their usage and usefulness and to strengthen and enrich a community. Placemaking can enhance a public space and make it come to life. You can help by identifying a public place and developing its positive potential so that whole community can benefit. The Eugene Association of Realtors is looking for ideas for neighborhood projects that can succeed with one of these $500 – $2,500 grants, awarded semi-annually. Applications must be received by Friday, March 27th, 2015. Placemaking can enhance a public space and make it come to life. You can help by identifying a public place and developing its positive potential so that whole community can benefit. Traffic calming measures are design and management strategies to balance street traffic with other uses to help create and preserve a sense of place so that people can safely walk, stroll, meet, play, and shop along and near streets. While we typically associate traffic calming with speed humps or curb extensions that narrow a roadway, creative use of paint or decorative plantings can also make streets safer, as well as enhancing the street space and make it appealing. These projects can help to reduce speeding along residential streets and help remind people they are in a neighborhood full of people — playing children, pets, dog-walkers, bicyclists, and individuals. Street paintings and other unusual visuals and activities — painting on the street, boulevard gardens, sidewalk chalking designs — can create cues that tell drivers to slow down and drive more attentively. NAR’s Placemaking Initiative encourages REALTOR® associations, and their members, to engage in Placemaking in their communities. Many Placemaking activities, often referred to as Lighter, Quicker, Cheaper, are small, inexpensive, and incremental community projects.They do not need to cost a lot of money to get off the ground. Nor do they need to take a lot of time to plan and complete. 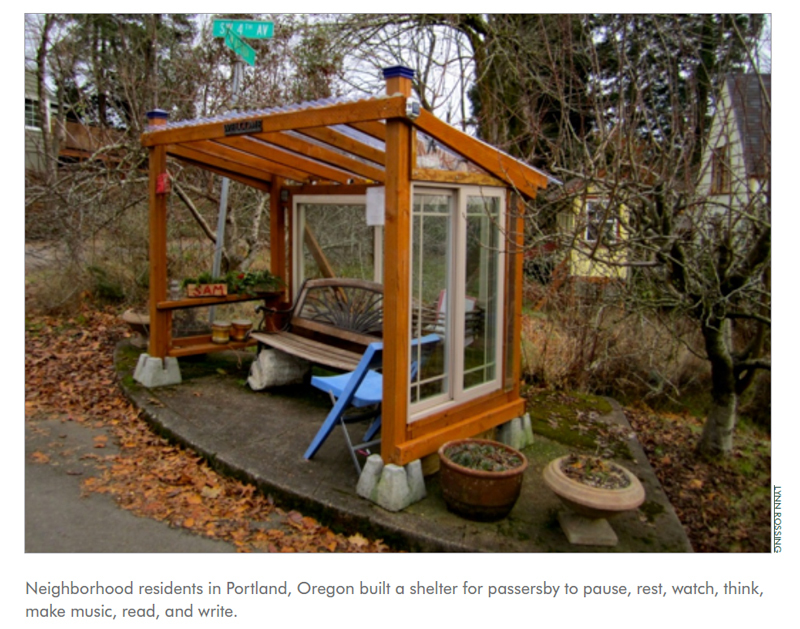 But, these smaller types of Placemaking activities can often help to improve a neighborhood and make it a better place to live, work and play. For larger Placemaking activities that support land-use activities, i.e., Better Block or Main Street projects, associations can apply for a Smart Growth grant. January 16, 2015 in Grants, Neighborhood Improvement.